With the world today being dictated by technology and the perks that come with it, boredom has literally become a thing of the past. The fact that we can play any game in our free time, enjoy a good gossip with a friend, call a family member living in another state or learn about literally anything from the internet without even getting up from where we are sitting is just amazing and opens the doors to a lot of expectations. However, before this ultra age of smartphones dawned over us, mankind had to look for different real life games to kill boredom and actually test their skills. Although many of these games and pastime activities have now become a part of history and have been forgotten by users, there are some that have stood tall against the change in technology to still provide an entertaining time for all players. 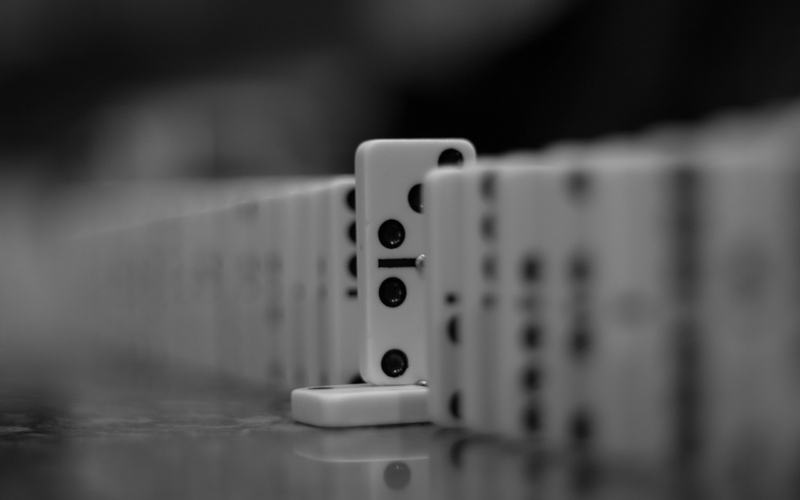 One pastime activity that has particularly fared well during this age of change is dominoes. Players and lovers from across the globe have just refused to let go of dominoes and all the interesting games they can enjoy with their domino tiles. Since many gamers nowadays don’t know a lot about this classic game, we have all the information pertaining to dominoes ready for you to go through. Just read through this article and you would be good to go with the perfect experience playing dominoes and showing off your skills to all your friends. For starters a domino is basically a small sparkling tile that is a combination of two dice that are represented through the figures on its face. The tiles, which are also commonly referred to as a bone by players, are rectangular in shape and have a line running down the center. The tiles are diverse and create an amalgamation from the numbers on a dice to create a diverse set of figures. The double six, which is the most popular domino set by a country mile, comes with numbers that vary from 0 to 6. This unique amalgamation of all these numbers creates roughly 28 bones for users to play with. The total number of tiles can perfectly be understood by implementing the concepts of permutation and combination that you studied during your college level math. The set of tiles in a set of ‘double-six’ dominoes starts from a blank on both sides of the line and ends with a six at both ends of the sides. 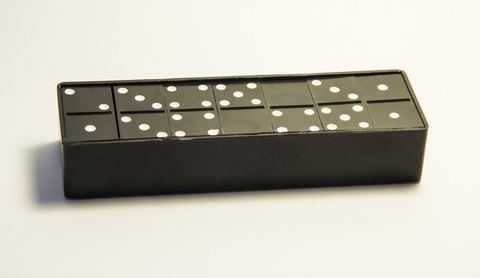 A common domino set is usually about 2 inches long, 3/8 inch thick and 1 inch wide. 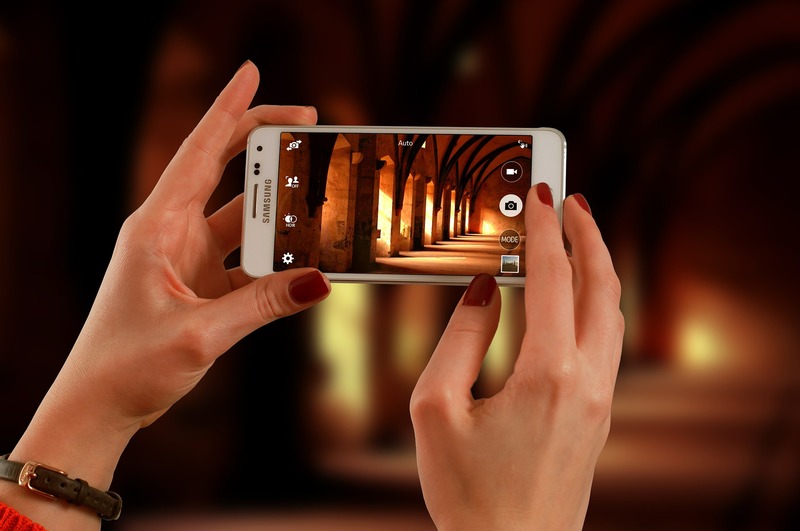 The size is small enough for the user to hold comfortably in one hand and thick enough to stand on its edges (you must have seen more than a dozen videos of the domino effect, where the tiles come rolling down once one of them is pushed down). Interestingly, the dominos/tiles/bones you have in your hands are called out based on the numbers they have on both of their rectangular ends. For example a domino tile that has 5 written on the upper end and 2 written on the lower end will be referred to as ‘5-2’. This means that the figure on the upper end comes before the figure on the lower end when you are referring to a specific domino tile. Moving on with this, a tile that has a similar figure on both the upper and lower sides is called as a double, which means that a domino with ‘4-4’ on it will be referred to as a double. A double six is the heaviest double while a double-blank is known as the lightest double in a double six game. While we have been mentioning the double six for reference when it comes to domino sets, there are other powerful sets available as well for the users. Users can also enjoy a double nine with 55 tiles, a double twelve with 91 tiles, a double fifteen with 136 tiles and a double eighteen with around 190 tiles in it. The larger sets can be used in a variety of instances including when you want a more complicated game or when you have more players playing with you. One of the first things that you need to do before a game begins is to shuffle the tiles in a way that no one gets to know about the location of any of the numbers. The game should purely be based on luck, so any form of bias, even in the way the tiles are handed out, should be eradicated through proper shuffling. The most authentic and tried method for shuffling these tiles is to have all the tiles that you plan to shuffle facing down on the table. This method would be extensive but would occasionally help keep intact the authenticity and excitement this game is known for. Once you have all the tiles lying face down in a table in front of you, you can start moving them around with a random motion of your arms. Here you need to be careful not to flip over the cards in your haste. It is often seen that the person shuffling the cards ends up flipping over the cards in his/her hurry. Once the cards are flipped over, you need to start the process all over again. It is imperative that you pay attention to detail and keep an eye on all these things, because even the slightest mistake can disturb the nature of the game. A collection of shuffled dominoes tiles is more commonly known as a boneyard. Make sure you remember the terms we are bringing up here, so you can actually mention them during a game to display your proficiency over what is happening. Before you actually begin with the game it is imperative that you decide who gets the first move. Now, this can be the cause of much concern in an unregulated game, but in regulated games this is handled in two ways generally. There is no reason for you to get in a conflict with your mates, as we have both these methods defined for you to see how you can make your progress further into the game even better. The first method follows the overall format of the game and selects the pick based on a random process. All the players playing the game pick a domino from the overall list and see who gets the heaviest out of the lot. The player who has got the heaviest domino, according to the analogy we mentioned above, would benefit from the first move in the beginning. Once these dominoes are picked and the order of the game seen, we move on to the next step of putting back these dominoes and reshuffling the tiles. Remember what we mentioned above? There should be no semblance of bias throughout the game. The second method for picking up the order of the game is done after distributing the allocated number of tiles to each person. The allocated numbers of tiles handed out to all of the participants will wary according to the people participating in the game and the game you are playing. Once the tiles have been drawn and distributed, the participant with the heaviest domino gets to go first. Simple and easy! Following this methodology would make choosing the round of players easier for all participants. Once you have decided the round of the game and who gets to go first, you can actually go towards drawing the tiles (the drawing process should be done before choosing who gets to go first, if you are following the second method mentioned above). The drawing process is fairly simple and does not require any complications as such. All of the tiles are efficiently placed on-edge in front of all the players. This is done to ensure that every player can see and record the value of his own tiles but does not get to see what the other person has. However, each person can see how many tiles other players have during all times of the game. Once the tiles have been drawn and allocated to all of the players and the procedure necessary for seeing who goes first is done, the first tile is placed on the table. The first tile is placed by the player who comes first from any one of the procedures mentioned above. Once the game has started with the first tile, you move towards playing the subsequent tiles. In almost all domino games, the open ends of the layout are the ones considered open to play with. An end is considered to be open when it has none of the other tiles connected to it. The double is often placed cross ways in the overall layout. This means that it is straddling against the end of the tile it is connected with. All additional tiles are usually only connected with the long end of one double. However, the rules state that all sides of a double are open towards connection, which allows dominoes to be connected with all four sides easily. The whole fun behind the game is to keep the connection interlinked and to add tiles to those that are already placed. However, users can also place a tile at a right-angle due to space constraints or just for the sake of it. This creates a ‘L’ like layout in the whole design. As the turns keep passing from one player to another, the game becomes more intriguing and even more fun. 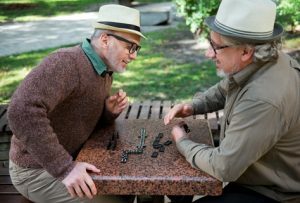 If one of the players playing the game is stuck in a situation where they are unable to make a move, they will have to propel the game forward by doing either one of these two alternatives. The choice of alternative really depends on the type of game that is being played. Once encountered by the situation mentioned above, a player can choose from these alternatives. He/she can either pass the move forward if they can’t add to the layout of the game or they can take out another tile from the boneyard of shuffled tiles. Once the player has the new tile in his/her hand, they can see whether the tile fits and whether they can alter the layout in a way. This procedure is followed till the boneyard is virtually empty. As of now, most of the rules governing the games being played with dominoes allow the boneyard to be completely empty for the game to end. However, some versions of the game do not give the players the authority to remove the last two tiles from the boneyard. These tiles are present with their face down. The winner eventually gains the value of these two tiles when the game is over. A game usually ends when a player ends up playing all their tiles, or when the game is blocked. When a player usually plays his last tile, according to tradition, he has to say the word domino. This means that all other players have now been dominoed. A game is usually blocked when none of the players can add a tile to the layout. 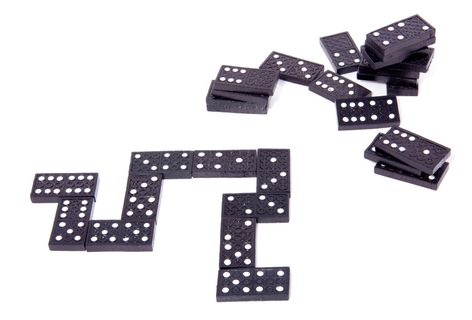 Domino games are basically played by awarding the pips on one player’s tiles to the eventual winner. With this scoring pattern in mind, the player who achieves the target score, selected before the game, or the player who gets the most points is given the coveted title of the winner for the game. This marks the end for the interesting game of dominoes.